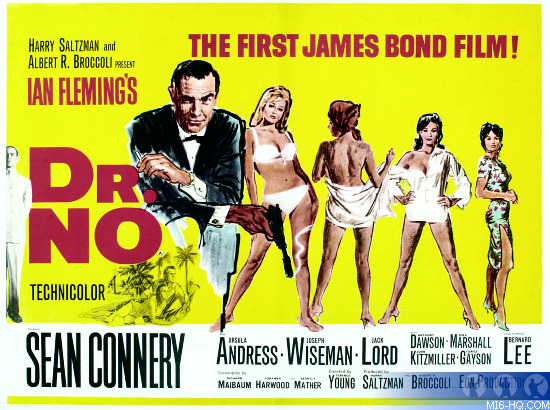 A quad poster for the original James Bond screen adventure, 'Dr. No' (1962) has sold at auction for £87,500. It was initially expected to raise up to £18,000. Insteda the lot far outshone a poster on sale in the same auction for 'Snow White' for an otherwise impressive £18,750. The Bond poster, lot 82, was described as "This British poster was the first poster for a Bond film and is therefore a highly prized collectors item. Linen-backed and conservation framed with UV plexiglass. Excellent condition with the colours remaining very bright. Very minor restoration to folds." The artwork for this poster was by Mitchell Hooks (1923-2013). Meanwhile a poster for Bond's third flick, 'Goldfinger' didn't appear to have the midas' touch, collecting just £11,250.